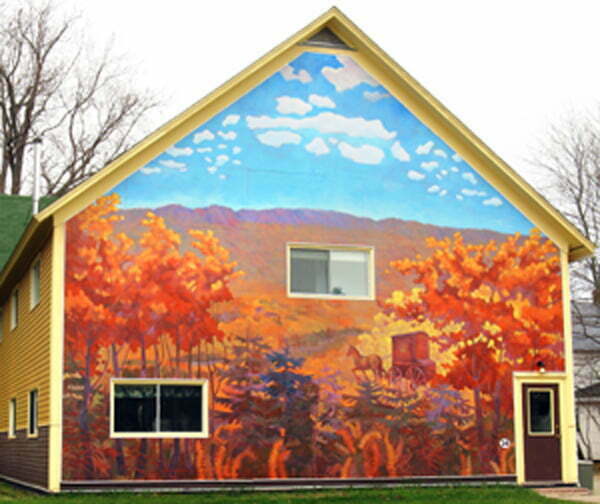 Experience the larger-than-life stories of the Sussex region when you visit the Mural Capital of Atlantic Canada! Many of the artists’ sketches are shown here, giving a glimpse of the process of painting these larger than life images. Taking the ideas from sketch pad to finished mural is both a painstaking and awe-inspiring process, with guests getting to watch the many internationally-renowned artists, including three from New Brunswick, at work. Explore the rest of our web site to see how these illustrations were transformed into a full colour outdoor art gallery! Visit our communities soon to see the finished paintings for yourself! 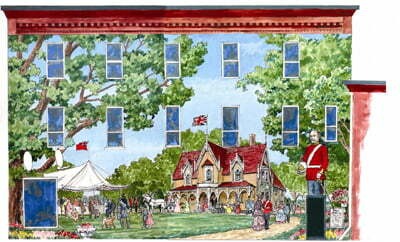 Be sure to include a souvenir postcard of the Sussex murals! Visit local businesses to choose from the colourful series to share your pride in the Mural Capital of Atlantic Canada! 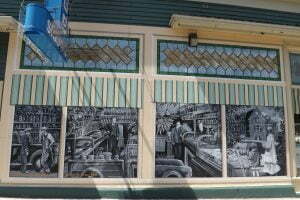 You can enjoy a self-directed tour of the murals at your own pace, with a full-colour guide available at Sussex town hall on the corner of Main Street and Maple Avenue and a variety of Sussex area businesses. 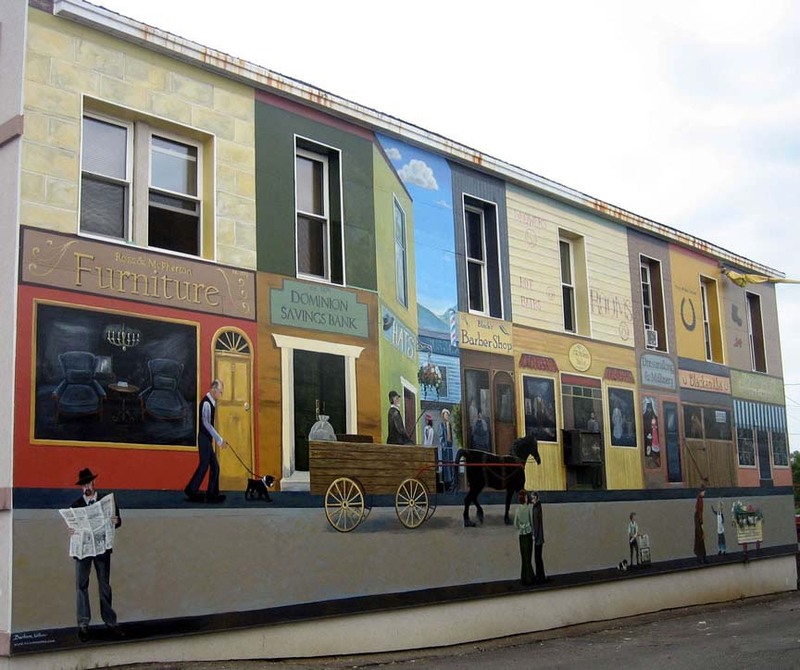 The historical aspect of a mural adds awareness of the roots and growth of a community and, I believe, a sense of belonging as well as pride in their neighbourhood to the residents. 18.4 x 7.8 mtr (60.5 x 25.5 ft) First design as submitted by artist. Sussex has been dubbed the Dairy Capital of the Maritimes and has a rich history of producing the nations’ finest cream, butter and cheese. The fertile valley has a rich loamy soil produced by the spring flooding of the many streams and waterways that criss-cross the landscape. Agriculture has been the main industry of this area since the first settlers arrived and the dairy industry has been the mainstay of the economy and a way of life for the people of Sussex Valley. 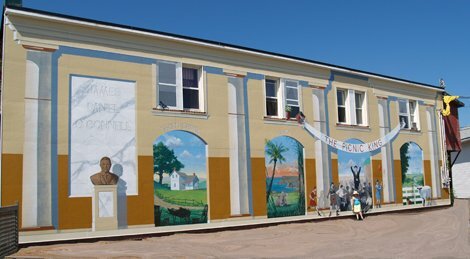 Fred aimed for a celebratory feel to the mural, with a graduating class from the Sussex Dairy School and families sharing in the event. 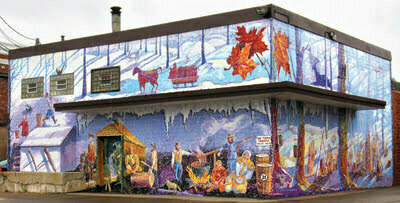 He also wanted his mural to show the land that supported the dairy industry, and give a taste of the varied activities involved in the production and delivery of the products. The artist: Fred Harrison has been a successful mural artist for twenty years, mainly painting in the London, Ontario area for private homes and businesses. His last major project was in Saskatoon, Saskatchewan, restoring the Roxy, a 1930 atmospheric theatre, where he was responsible for the décor and where he added two small murals to the lobby area as well. He loves the challenge that large-scale work gives him and the fact that it is constantly interacting with the public. 33.5 x 5.6 mtr (110 x 15 ft) First design as submitted by artist. It is probable that Sussex Station would have been located at Sussex Vale, the current Sussex Corner. A story tells however, that its most influential citizen, Hugh McMonagle, raised objections to the railway crossing his farmland and racetracks. When after a re-survey, the train stop was made 3.5 km west of Sussex Vale, it brought about the birth of a new village, later to become the Town of Sussex, while the growth of the Vale came to a standstill. A less likely place for the site of a future town could hardly have been found. The lower part of the village site was a swamp overgrown with willow and alder bushes, and over-run with little brooks ending here and there in stagnant ponds. The whole area was subject to flooding during the spring and fall freshets and at this time there were only three houses in the general vicinity of the train stop. 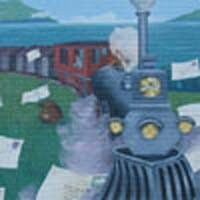 The first sods for the railway were turned in September 1853. 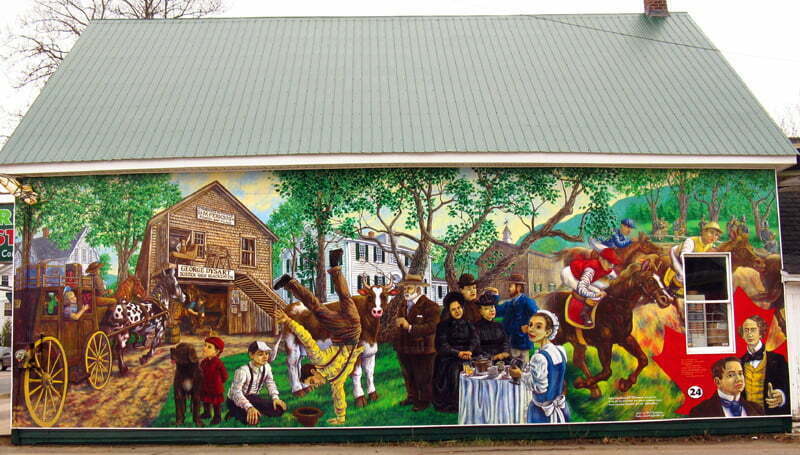 The mural shows the arrival of the first train on Nov. 10, 1859, which was a great and memorable event in the lives of people and hundreds came to Sussex, all eager to see the train arrive. The occasion affords a glimpse of different modes of transportation, as well as a panorama of the young town. The artist: Fred Harrison has been a successful mural artist for twenty years, mainly painting in the London, Ontario area for private homes and businesses. His last major project was in Saskatoon, Saskatchewan, restoring the Roxy, a 1930 atmospheric theatre, where he was responsible for the décor and where he added two small murals to the lobby area as well. He loves the challenge that large-scale work gives him and the fact that it is constantly interacting with the public. Fred Harrison, Sussex, New Brunswick The logging industry was a major component of the early New Brunswick economy. Many lumber camps and saw mills were located on the main waterways. Life at a lumber camp was labour intensive and dangerous. Logs were harvested from the forest with horses and sleighs and sent down river in huge log drives in the spring freshets. Men would travel on top of the logs to make sure they made it to their destination. It was a dangerous job and many a log driver lost his life in a logjam. 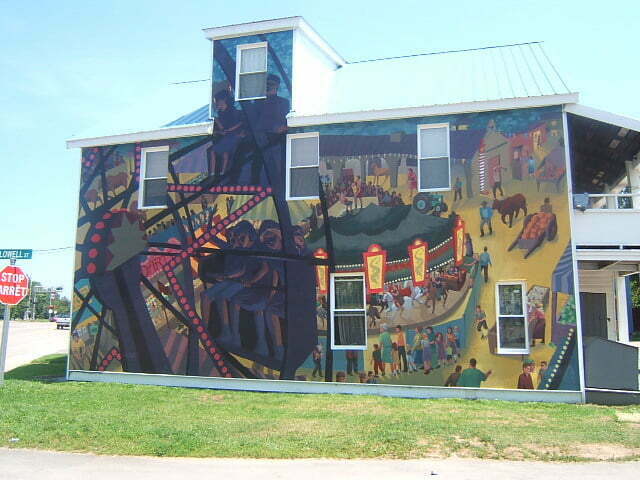 The mural is located on Nicholson Hall, named after Rev. R. Nicholson, a local art teacher who was known for his colourful paintings of early logging in New Brunswick. The artist: Fred Harrison has been a successful mural artist for twenty years, mainly painting in the London, Ontario area for private homes and businesses. His last major project was in Saskatoon, Saskatchewan, restoring the Roxy, a 1930 atmospheric theatre, where he was responsible for the décor and where he added two small murals to the lobby area as well. He loves the challenge that large-scale work gives him and the fact that it is constantly interacting with the public. 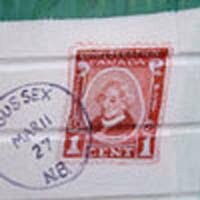 Fred Harrison, Sussex, New Brunswick In Sussex Corner, Hugh McMonagle’s stagecoach inn still stands, although no longer in use as such. McMonagle was a prominent businessman and politician in the mid-1800s who introduced the Morgan Horse to New Brunswick. His racetracks, one of them being the fastest half-mile track in North America, brought visitors from as far away as Kentucky. He was a driving force to make Sussex the agricultural leader it is today. Being a man who believed in his home county and not shy to let others know what was here, made him the perfect candidate to represent the region on a national scale. The artist: Fred Harrison has been a successful mural artist for over twenty years, mainly painting in the London, Ontario area for private homes and businesses. His last major project was in Saskatoon, Saskatchewan, restoring the Roxy, a 1930 atmospheric theatre, where he was responsible for the décor and where he added two small murals to the lobby area as well. He loves the challenge that large-scale work gives him and the fact that it is constantly interacting with the public. Bonny Hill and Fred Harrison, Sussex, New Brunswick. The Sharp Family has owned and operated their Corner Drug Store since 1897. The Store was relocated to this building on Broad Street in 1929 after a fire demolished the previous location. 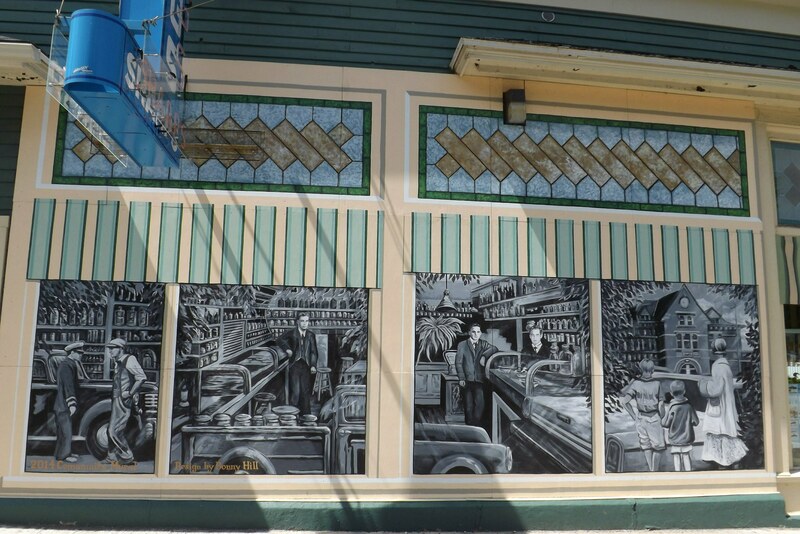 The mural depicts images passing by and reflected on the “glass” of the window of the store. What wonders have these old windows seen in years gone past? The figures inside may indeed be Bev Sharp, his father and his old friend Jarvis McQuinn. 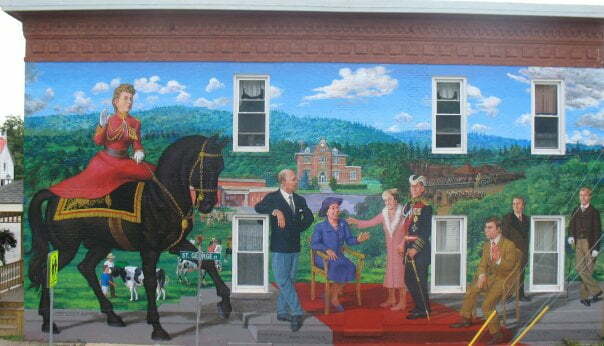 Their legacy to the Town of Sussex lives on in this mural. The artists: Bonny Hill has been teaching visual arts in New Brunswick high schools for over twenty five years and was recently recognized by the Canadian Society For Education Through Art as Art Educator of the Year (secondary level, 2011). Although she has only been making and showing work seriously since 2006, she has been given four solo shows and an ArtsNB Creation grant since that time, and completed work on a second grant in 2012. 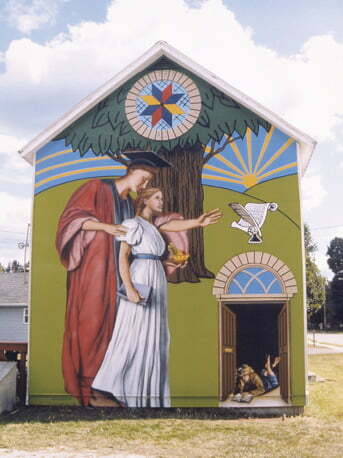 Fred Harrison has been a successful mural artist for over twenty years, mainly painting in the London and Toronto Ontario areas for private homes and businesses. His last major project was in Saskatoon, Saskatchewan, restoring the Roxy, a 1930 atmospheric theatre, where he was responsible for the décor and where he added two small murals to the lobby area as well. He loves the challenge that large-scale work gives him and the fact that it is constantly interacting with the public. 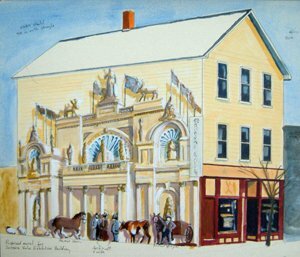 Many of the stories from “The Story of Sussex and Vicinity, New Brunswick” by Grace Aiton, published by the Kings County Historical Society, and “Historic Buildings of Sussex” published by the Sussex Bicentennial Committee come to life in vibrant colour in these exciting images. We are grateful for the detailed historical background information supplied to us by Don MacVey and Don Stiles. Mary Norrad, Mac McElroy, Paul Stiles, Black’s Holdings, Mercantile Holdings, Lounsbury Furniture Ltd., Town of Sussex, Abundant Life Pentecostal Church, Classic Auto Glass & Upholstery, St. Marks Anglican Church, Scotiabank, Alfred Smith, Rick Horton, Bruce Carhart, Dairytown/Mrs. Dunsters, Bethany Bible College/Kingswood University, Bank of Montreal, Miller Family, Mike Bailey.